The University of North Alabama’s Emergency Plan outlines the campus' procedures for managing major emergencies that may threaten the health and safety of the campus community or disrupt its activities. The plan identifies departments and individuals that are directly responsible for emergency response and critical support services, and it provides a management structure for coordinating and deploying resources. At UNA, planning ahead for emergencies is part of normal business planning and campus life; all members of the campus community share a responsibility for preparedness. An emergency can strike anytime or anywhere, and a disaster will affect everyone. All administrative and academic units are expected to maintain a Department Emergency Plan to protect personnel and support campus emergency response. All employees and students have a personal responsibility for knowing what to do before, during, and after an emergency to protect their safety and their work. The University maintains a comprehensive emergency preparedness education and training program to reduce potential hazards, and to familiarize students and employees with emergency procedures. The University of North Alabama’s Emergency Plan is written, reviewed, and amended by the Safety and Emergency Preparedness Committee. This committee provides general oversight for the entire emergency planning process to address ongoing preparedness, response, and recovery issues. The Emergency Plan may also be activated during a community or regional crisis that may impact the University personnel or business operations. For example, a utility outage in the area, a serious toxic spill on a major highway, or a large fire in a local area may necessitate a Plan activation to coordinate safety precautions or emergency information for personnel. 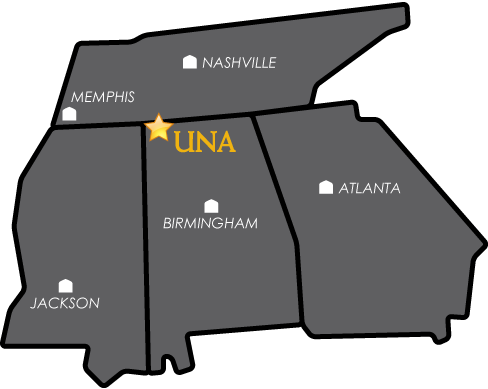 UNA recognizes and maintains that a major emergency in the community that affects our students, faculty, and staff is an institutional emergency.